The First Responders are a group of trained volunteers who work with the ambulance service to provide immediate life saving care to patients whilst an ambulance is on the way. Bothel team are able to respond rapidly providing trained emergency support, oxygen therapy and cardiac resuscitation facilities to support the local community. Such local support is of especial importance in rural communities located at some distance from the ambulance station. The incidents that First Responders attend include; cardiac and respiratory arrest, stroke (CVA), collapse, diabetic emergencies, haemorrhage, convulsions/fitting/fainting, choking, chest pain, breathing problems, and allergic reactions. 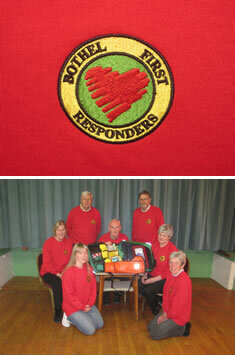 Bothel First Responders were one of the first active groups in Northern Cumbria. The value of the service has been recognised in the region and similar groups are now active in villages throughout the UK.